Today we get to know tenor Nathaniel Peake, who makes his Seattle Opera debut tomorrow night as Pinkerton in Madama Butterfly. He'll also sing the role on the Sunday matinees on May 13 and 20, opposite Lithuanian soprano Ausrine Stundyte (who, like all our Butterflys and Pinkertons in this production, is also making her company debut. You can hear clips of several of our Madama Butterfly artists on our cast page). 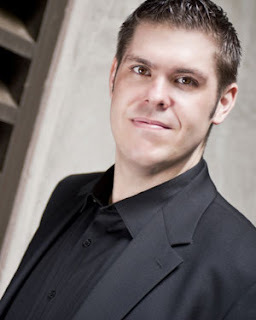 We recently sat down with Nathaniel and asked him how he got his start in opera, what he thinks about Pinkerton, and about his recent performance singing the national anthem at Safeco Field. You’re new to Seattle Opera. Welcome! Can you tell us about your background and how you got your start in opera? I played French horn through junior high and high school and wanted to pursue that in college but when I auditioned for undergrad, I didn’t get a scholarship. So I studied voice instead and I was going to be a teacher. And I don’t know if I should say this, but I’m going to anyway: my undergrad professors told me I should pursue something else and not do music, not do singing. Really? Why did they say that? I don’t know! There was a lot of drama. I took a year off to repair and figure out what I wanted to do with my life, and then I thought, “I’m going to try performing and see how far I can go.” When I auditioned for graduate school, I got three full rides at three different schools—so I’m just glad I didn’t give up when those first doors shut. And now I tell my students and my friends that the best way to get back at someone is through your success. Sometimes you can be wrong about people. 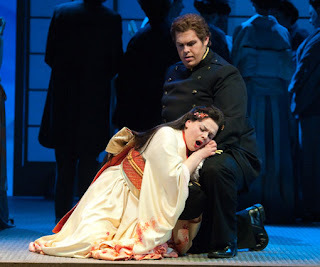 Nathaniel Peake (Pinkerton) and Ausrine Stundyte (Cio-Cio-San) in Seattle Opera's current production of Madama Butterfly. So where has your career taken you between grad school and now? I did my graduate program at Michigan State and got a lot of experience, and since then I’ve been in several young artists programs. The past couple season—2010/11 and 2009/10—I was at Houston Grand Opera, and before that in 2008/09 I was at Syracuse Opera. And in the summers of 2008 and 2009 I was part of the Merola Opera Program at San Francisco Opera, which is actually where I met Peter Kazaras, our stage director for Madama Butterfly. He was directing Albert Herring and I sang in a master class of his. Also, in 2010, I was one of the five final winners of the Metropolitan Opera’s National Council Auditions. So how did you come to be involved in this production of Madama Butterfly? When I started at Houston Grand Opera in their young artists program, I sang Nemorino in their Elixir of Love (which was probably not the best fit for me vocally). In my second year, they were doing some performances for invited schools and I was asked to sing Pinkerton. At first, I was kind of afraid of it. It’s Puccini! And so big. But it turned out to be the first role I’ve ever learned that I feel I can sing even after rolling out of bed at 3 a.m. I probably did seven or eight performances of it last season as part of HGO, and then I auditioned for Seattle Opera General Director Speight Jenkins in New York last season. So let’s talk about Pinkerton. He tends to elicit strong opinions from audiences, but what do you think about him? Well, I don’t hate Pinkerton. I think a lot of people can identify with him because he’s just a young guy who is basically ignorant to the world. He’s in this new land and he’s been offered by Goro an opportunity to “marry” this girl, and he doesn’t consider it a real marriage. He thinks it’s just for fun, and he doesn’t think he’ll ever be back there again. He has no intention of ruining Butterfly’s life. He just thinks it’s kind of a game, and that when he leaves she’ll get married off to someone else, too, and life will go on. So I don’t think he’s a bad guy. And there has to be something she likes about him. If he’s a jerk all the time, why would she have fallen so deeply in love with him? 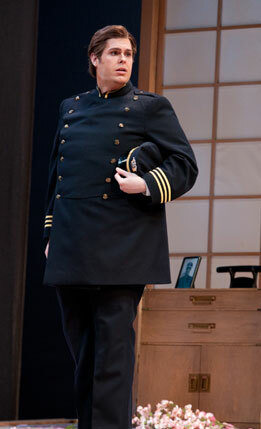 Nathaniel Peake (Pinkerton) in Seattle Opera's current production of Madama Butterfly. And, ultimately, he regrets his actions. Oh yeah, totally. In Act 3, he is completely devastated. He didn’t think about consequences of his actions. I also think he’s haunted because when he first signed up for this little marriage thing, he didn’t realize that he would like her. But when her Uncle Bonze comes in and disowns Butterfly, and all her family walks out on her, Pinkerton realizes how strong she is and he sees something in her that is incredible. Pinkerton doesn’t appear in all of Act 2, so what will you do backstage in that down time? I’ll probably just talk to the makeup people! I could also probably read a whole book during Act 2 because it’s pretty long, and I think it’s where the meat of the show is. When Act 2 begins, it’s been three years, Butterfly and Suzuki are running out of money, but Butterfly is still hoping Pinkerton will come back. She says, “When the robins nest, then he’ll come back.” And she’s like, “It’s so weird that the robins only nest every three or four years. Wow, when are they going to nest?” So as a performer, I try not to watch any of this because I don’t want it to affect how I come in for Act 3. Because I totally identify with Butterfly more than I do Pinkerton. It isn’t too difficult to identify with her. I’d guess most people have known a Pinkerton or two in their own lives. Yes, absolutely. Or some people are a Pinkerton and perhaps think, “I don’t see what the big deal is.” [Laughs] But for me, it’s just heart-wrenching, the struggles she goes through. 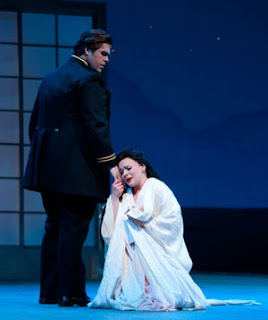 Ausrine Stundyte (Cio-Cio-San) and Nathaniel Peake (Pinkerton) in Seattle Opera's current production of Madama Butterfly. Do you also have to do any vocal exercises to make sure you’re ready to go for Act 3? Yeah, I do. It’s not a whole lot of singing in Act 3, but it’s big singing. Also, whenever you’re doing a role that’s emotionally intense, you have to be very careful technically. Sometimes composers will write you something very high, as if you’re screaming, but obviously you can’t actually scream. It’s this weird and funny balance of stepping back from the emotion so that you can sing the line, while still conveying the emotion dramatically. I used to go all out and leave a piece of myself on the stage, and then I realized I could only do that for so long. Let’s talk about the Butterflys in this production. We hear you’re a big fan of Patricia Racette, who sings the role on opening night, opposite Stefano Secco. Yeah, she’s an amazing actress. The first video I ever saw of Butterfly, which was while I was learning it in Houston, was of an HGO production starring her. She’s sung Butterfly all over the place and now watching her do it here…. I just want to sit her down and interview her and ask so many questions. Like, how does she keep herself so dramatically invested in the role after singing it so many times? And, of course, there’s your Butterfly, Ausrine Stundyte. Ausrine is amazing. She connects with you immediately on stage. There are some singers who sing over your shoulder or above your head, but she’s always looking into your eyes. It’s comforting to be in a scene and get to be completely in that scene, actually becoming these people in this relationship. You don’t always get that. But Ausrine is such an open performer, and it’s so easy to be Pinkerton with her. 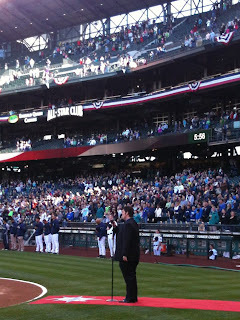 Nathaniel Peake singing the national anthem at Safeco Field on April 14, just before the Mariners took on the Oakland A's. 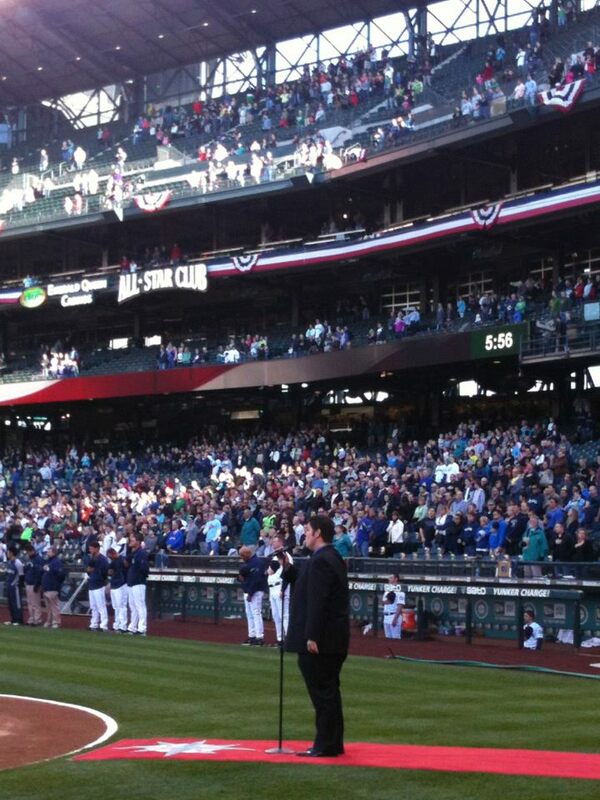 On a completely different topic, you recently sang the national anthem at a Mariners game! What was that experience like? It was so fun! It was my first time singing an anthem at a ballgame, and I was really nervous because I hadn’t been feeling well and it was also my first public performance as part of Seattle Opera. Plus, I was in front of all these baseball fans who are used to this tradition of the pre-game anthem, and you don’t want to screw up their tradition. If you miss one word, even in the birds in the place will know. But you did a good job with it! Several people in the crowd gave you kudos as you walked off the field. I know, that felt so good. I also appreciated that the Mariners had the words up on the big screen. Once I found that out, I knew I’d be good to go. But yeah, it was awesome and I definitely want to do something like that again.